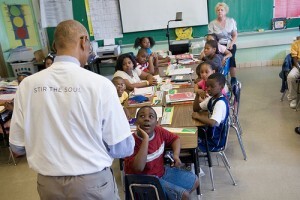 Most of us would agree that the success of the American education system is dependent on the strength of good teachers. And in order to create good teachers, we need to change the way we think about their role in society. Today's big education headlines suggest things are shifting in that direction. A report by the National Council for Accreditation of Teacher Education recommends that the best way to prepare teachers to teach is by putting them in the classroom as a dominant part of their training. Just as a hospital residency is a core part of becoming a doctor. The report’s main recommendation: Supervised, structured work of teacher-candidates in diverse classroom settings must be the foremost component of preservice teacher training, with other aspects like coursework embedded in that training. It draws heavily on the teacher-residency model and a handful of university-based education programs that take such an approach to training new teachers. And in fact, Duncan "said that the changes embodied in the NCATE report represent 'the most sweeping recommendations' for teacher education made in the century-long history of the nation’s education schools." To that end, eight states -- California, Colorado, Louisiana, Maryland, New York, Ohio, Oregon, and Tennessee -- will begin piloting a new teacher-training program following these recommendations. Connecting student performance to teachers and to the schools that trained them will also be part of the new program, according to the Wall Street Journal. [Maryland Superintendent Nancy S. Grasmick] said the state planned to use a new system to track student performance back to teachers and to the teaching schools that trained them. For now, she said, it would be "diagnostic," a way to help teaching programs find the areas they need to improve. She said she might be interested in using student performance data in reaccreditation decisions, as Louisiana started to do last year. It might not exactly be reinventing the wheel, but these changes seem to address the core changes that the education community has been clamoring for.